The attempt by the Palestinian Arabs to create a second state - in addition to Jordan - reached the hallowed halls of the two million members of the Presbyterian Church in America this week. By a razor thin margin of 333-331 with two abstentions, the General Assembly of the Presbyterian Church (USA), being held in Pittsburgh, rejected a motion to divest from Caterpillar, Hewlett-Packard and Motorola Solutions. The General Assembly is the highest decision-making body for the church. A 2011 church report found that Caterpillar supplies bulldozers for the demolition of Palestinian homes, Motorola provides cell phone technology to West Bank settlements and Hewlett-Packard manages information technology for the Israeli Navy. The decision to vote on divestment came after the companies allegedly refused the church’s entreaties to change their policies in regard to providing services to Israel. The ongoing fascination the Presbyterian Church apparently has for the cause of the Palestinian Arabs does not appear to be matched by any concern for other peoples around the world struggling for recognition of their right to self-determination. “Must all national and ethnic groups that want their own states and have struggled for them - get them, in the name of self-determination? If so, why haven’t the Imazighen (Berbers), who predate their Arab conquerors by millennia and who have had their own language and culture, have their own state? Why is there no independent Euskadi state for Basques? Elsewhere in Europe, why is there no state for the Bretons of Brittany, the Flemings of Flanders, the Catalans of Catalonia in north-eastern Spain, the Frisans in the Netherlands, and the Sami people in northern Norway, Sweden, Finland and on the Kola Peninsula of Russia? Why is there no state of Tibet, Jola state of Casamance (southern Senegal), Lunda state of Katanga, Luba state of South Kasai, Ibo state of Biafra, Tuareg state of Azawad, stretching across the Sahara from Mali to Niger, Tamil state in north-eastern Sri Lanka, a state of Cabinda, and a state of Kurdistan? Of all the peoples on earth who have not yet been granted the sovereignty they have fought for–the Chechens of Russia, the Uighurs of China, the Karens of Myanmar, the Mizos and Nagas of northeast India, the Saharawis of Morocco, and the Acehans of Indonesia, to name but a few–why must the Palestinian Arabs be given a second Palestinian Arab state? 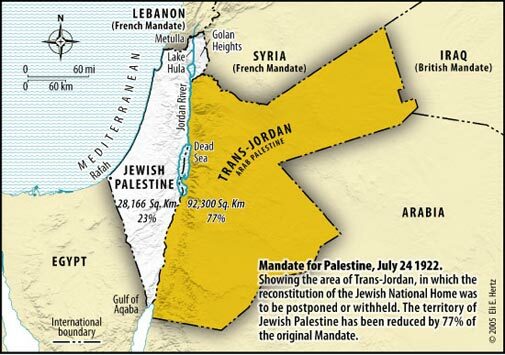 They already make up some 80 percent of the population of Jordan, a nation created by the British in 1921 from 77.5 percent of the original British Mandate of Palestine which was to be the Jewish National homeland. There never was a separate Palestinian Arab people, distinct from other Arabs during the 1,192 years of Muslim hegemony in Palestine under Arab, Umayyad, Abbasid, Fatimid, Seljuk, Ayyubid, Mameluke, and Ottoman rule. Should the Palestinian Arabs alone be acknowledged by many, of deserving not one, but two states? One important benchmark of nationhood must be the degree of difference from its neighbors, and the need for a state to protect that uniqueness. The Tibetans, for example, have their own special culture, language, and religion, which they will lose if they continue to be ruled by the Chinese; the Kurds have a culture and language unlike that of the Arabs; the Karens, a language and religion different from that of the Burmese. Unlike these various groups around the world - the Palestinian Arabs were offered their own state by the Peel Commission in 1937 and by the United Nations in 1947 - and rejected both opportunities. Between 1948-1967 the Palestinian Arabs could have created an independent state in the West Bank and East Jerusalem - but chose to unify the West Bank with Jordan and become Jordanian citizens. In 2000 and 2008 Israel made generous offers to the Palestinian Authority to divide sovereignty between them - which offers were again rejected. The daily lives of 95% of the West Bank Arab population are now under the direct control and administration of the Palestinian Authority. The state of Palestine has been admitted as a member state of UNESCO, competes in FIFA Soccer international competitons and will march under its flag at the Olympic Games in three weeks time. Palestine has more diplomatic missions in countries around the World than Israel. Why has the Presbyterian Church therefore thought it necessary to continue to concentrate its efforts in support of the Palestinian Arabs to the exclusion of other peoples engaged in the same struggle around the world - especially as the Palestinian Arabs have been offered so many opportunities in the past to obtain what they seek now - but have rejected those offers on each occasion? 1. Pension funds in Norway and Sweden - that have divested themselves of holdings in some firms involved in building in settlements or helping to erect Israel’s contentious West Bank separation barrier. 2. European activists - who picket stores that sell goods produced by Israelis, interrupt concert performances by Israeli artists in theatres around the world and object to Israeli academics lecturing in overseas universities. 3. The United Nations and the United Nations Human Rights Council - that both focus almost entirely on the plight of the Palestinian Arabs and virtually none of those other peoples around the world denied any international recognition or support of their Peoplehood. The Presbyterian Church and these other groups must believe that their actions can influence the resolution of the conflict between Arabs and Jews in relation to the allocation of sovereignty in the West Bank and East Jerusalem. Otherwise why engage in this kind of conduct? Why then do they not take similar action against China, Russia, Norway, Sweden, Turkey, Iraq and Indonesia to support many of these other groups striving for recognition of their own Peoplehood? Are the Jewish people being singled out once again - whilst other national, religious and ethnic groups slip under the radar? Double standards - clearly evident in the support of one group to the exclusion of other groups similarly seeking self-determination - requires to be explained.